Pop into APG Works and discover something new. APG Works has made its home in an old cutlery factory on Sidney Street. APG is more than a gallery, the studio is a place to find art and artists, at work and exhibiting. 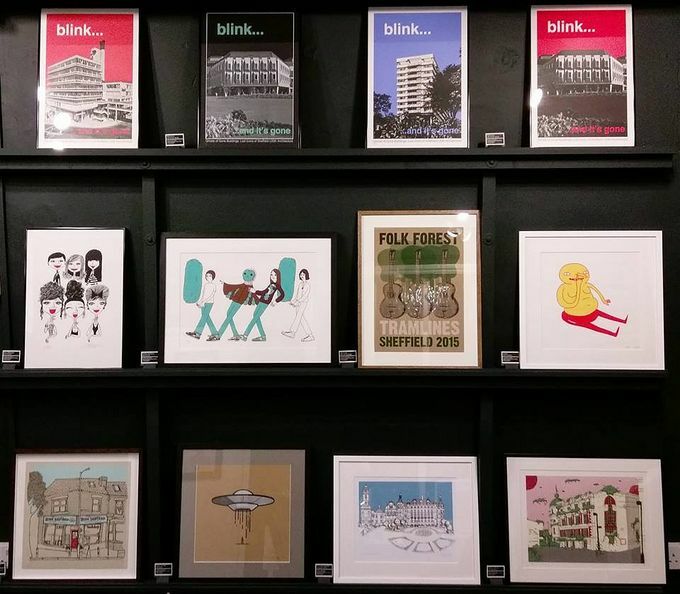 This Christmas, APG Works is opening until 7:30pm on Thursdays, that’s two hours extra hours to collect, order and browse the gallery’s huge range of framed original screen prints. There are also a few gems that are only available instore, so it’s well worth a visit! APG Works stocks prints from some of Sheffield’s most well-known artists, including Kid Acne, Phlegm, Martin F Bedford, Tom J Newell and more. There are prints themed around the city, some featuring much-loved buildings of time gone by including the hole in the road and Grosvenor Hotel, text based pieces and more abstract prints. As well as selling and producing screen prints, APG Works offer picture framing, digital print, giclée reproduction, canvas printing, posters and t-shirt printing. APG Works is open till 5:30pm weeknights, with the exception of Thursdays, when the gallery opens until 7:30pm.